"I usually make these around Christmas." Separate egg, reserving egg white. Cream butter or margarine, sugar, and egg yolk. Add vanilla, flour and salt, mixing well. Shape dough into balls. Roll in egg white, then walnuts. Place on cookie sheets about 2 inches apart. Bake for 5 minutes. Remove cookies from oven. With thumb, dent each cookie. 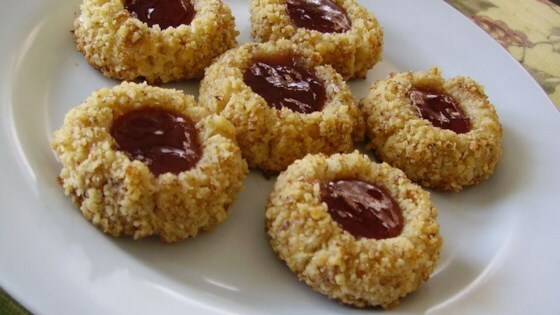 Put jelly or preserves in each thumbprint. Bake for another 8 minutes.